Bright light may work for non-seasonal depression. This is the conclusion of a study published in the prestigious psychiatric journal JAMA Psychiatry. Researchers at the University of Toronto and the University of British Columbia in Canada conducted a randomized, double-blind, placebo- and sham-controlled, 8-week trial in adults (aged 19-60 years) with major depression of at least moderate severity. 122 patients were randomized to light monotherapy (32 patients); fluoxetine monotherapy (31 patients); combination therapy (29 patients); or placebo (30 patients). Patients could not have a season al pattern to their depression, bipolar depression, substance abuse or dependence within the past year, or serious suicidal risk. Patients were also excluded for treatment resistance during the current episode (lack of response to ≥2 antidepressants at therapeutic doses for >6 weeks) or for using other concurrent treatments for depression, including psychotherapy. The patients in the fluoxetine monotherapy group received 20 mg a day of fluoxetine which is usually a therapeutic dose. In this study light therapy (10,000 lux of light for 30 minutes at 1.5 feet from the eyes and between 7 and 8 am in the morning) was much more effective than fluoxetine alone. One important point to note about this study is that it had an unusually low rate of treatment response to fluoxetine, in terms of the rate of positive response at eight weeks, fluoxetine was not better than placebo, and was actually slightly worse than placebo in terms of the percentage of people who achieved remission of depression. 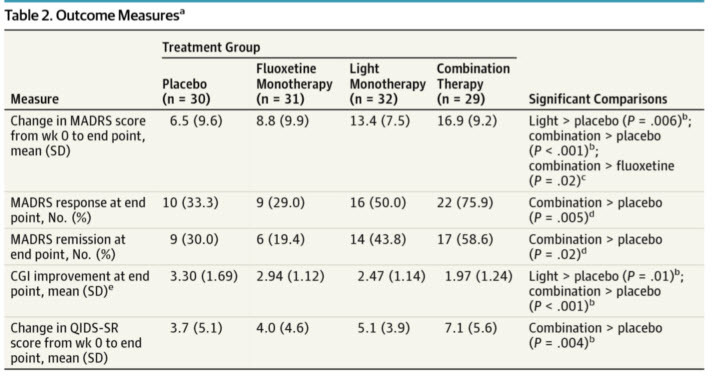 Nevertheless it is interesting to note that light monotherapy as well as light plus fluoxetine combination therapy was much more effective than fluoxetine alone. Lam RW, Levitt AJ, Levitan RD, et al. Efficacy of Bright Light Treatment, Fluoxetine, and the Combination in Patients With Nonseasonal Major Depressive Disorder: A Randomized Clinical Trial. JAMA Psychiatry.Published online November 18, 2015. doi:10.1001/jamapsychiatry.2015.2235.